Once upon a time a family of bears went to Earith Village Hall to watch a panto. “Someone’s been sitting in my seat”, said Daddy bear. “Someone’s been sitting in my seat”, said Mummy bear. “Someone’s been sitting in my seat”, said Baby bear, “and they’re still sitting in it!” Don’t be like a bear – be sure to reserve your seat. Be frayed, be very frayed! Keep your nose peeled, your eye to the grindstone and ears in the back of your head – Defective Inspector Pratt is returning to Bluntisham! It was four years ago, in 1936, that Inspector Pratt first came to Bluntisham to investigate the murderous goings on at Bagshot House in our smash hit production of Peter Gordon’s comedy murder mystery Murdered to Death. Mildred Bagshot’s convivial weekend with her friends took a turn for the worse when she was unexpectedly murdered to death. Using his unique policing methods Pratt completely failed to solve the crime or apprehend the perpetuators, but he did almost add to the body count when he staged a reconstruction and shot long-suffering Constable Thomkins (or was it Thompson?) in the foot. Fortunately, local busybody and amateur sleuth Miss Maple was on hand to unravel the mystery. Pratt attempted to take all the credit for bringing the perpetrators to justice of course, despite not having the faintest idea what was going on. Four years on and three years later, it is the summer of 1939. The storm clouds of war are gathering over Europe as Inspector Pratt returns to Bagshot House in the eagerly-anticipated sequel Secondary Cause of Death. Having inherited Bagshot House, Colonel Charles Craddock has converted the property into a hotel for the discerning visitor. Inspector Pratt arrives bearing grim news for Colonel Craddock, but that’s just the beginning. Who is the strange Polish Count? Is Henrietta really an army captain? And where does the flamboyant thespian Cardew Longfellow fit into the picture? When Joan Maple’s sister Cynthia arrives to stage a murder mystery evening, it’s not long before Pratt’s visit turns into a chaotic nightmare as the bodies pile higher than ever! The prospects for the new inhabitants of Bagshot House are looking grim, but we can promise you, as Colonel Craddock would say, a “jolly good show”. Tis the season to be jolly… jolly baffled by this year’s crop of Christmas TV adverts. Personally, I can’t help but feel nostalgic for simpler, more innocent times, when a fox and a badger could bounce side by side in perfect harmony on a garden trampoline as a symbol of hope for a future of peace, harmony, togetherness and goodwill to all. 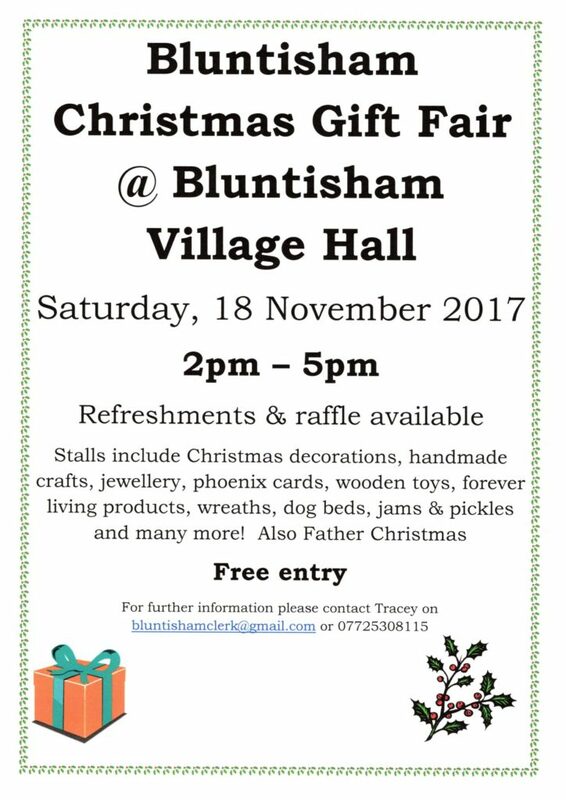 If you feel the need for something a bit more Christmassy to get you in the festive mood, come along to the Bluntisham Christmas Craft Fair next Saturday afternoon. There will be a wide range of stalls selling all sorts of things. We will be there too, promoting our next show and running our ever-popular tombola. I can’t promise you a winner every time, but I can promise you the chance to meet some friendly actors. Do come along and say hello!